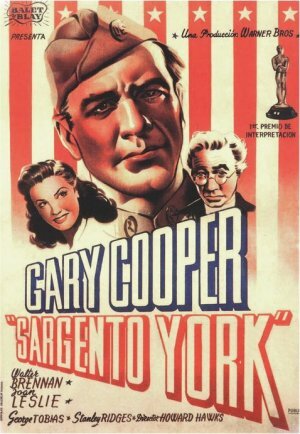 Filme de carácter autobiográfico al basarse su argumento en la vida del granjero pacifista Alvin York, quien superados sus escrúpulos cristianos en orden a participar en una contienda bélica, logró ser considerado un héroe gracias a su valor y extraordinaria puntería en la primera guerra mundial. Ray Teal, Selmer Jackson, Donald (I) Douglas, Frank Orth, Noah Beery Jr, David Bruce, Elisha Cook Jr., Stanley Ridges, Creighton Hale, Frank Wilcox, Margaret Wycherly, Tully Marshall, Gig Young, Russell Hicks, June Lockhart, Harvey Stephens, Arthur Aylesworth, Theodore Von Eltz, Walter Brennan, Roland Drew, Charles Middleton, Joe Sawyer, Lucia Carroll, Jody Gilbert, Kit Guard, Pat Flaherty, Jean Del Val, Steve Gaylord Pendleton, Dickie Moore, Rita La Roy, Victor Kilian, Jane Isbell, Lane Chandler, Ward Bond, Kay Sutton, George Irving, Charles Esmond, Lasses White, Joan Leslie, Gary Cooper, George Tobias, James Anderson, Frank Faylen, Charles Drake, Clem Bevans, Murray Alper, Ed Keane, Frank Marlow, Si Jenks, Guy Wilkerson, Robert Porterfield, Joseph W. Girard, Jack Pennick, William Haade, Howard Da Silva, Erville Alderson, Charles Trowbridge. Howard Hawks (Dirección), Sol Polito (Montaje), Abem Finkel, Harry Chandler, Alvin C. York, Tom Skeyhill, John Huston, Howard Koch (Guión), Max Steiner (Música).